Friday night class with sensei was good as usual. Not so many people were there (less than 50) and we had enough space to apply the tachi kumiuchi feeling with the bô. Once again if you want to study bô jutsu or any of the long weapons, it is better to come to Japan when not so many people are there and summer seems to be the best option. Sensei asked me to do a technique as he usually did. Opening the class is always a privilege but it is every time more difficult. In the past when he would ask me for a technique I was nearly in panic and the result was not very good even though he would always find something to do with it. Then over the years my confidence built in and I went through various stages: showing something worth it; doing it good; looking good; etc. At one point I was not scared any more of making mistakes. That was the first major evolution. Then as I am coming every four months my goal as to show him that I benefited from his lessons and evolved in my taijutsu. Recently as I said it became more difficult as my objective now is to be in adequacy with the theme of the year and to give him a movement where his kaitatsu imagination would unleash to help us go deeper in the theme of the year. As I attend around five classes each time I come to Japan the first class is easy but the following ones are so close from one another that I have to focus more on what he has been doing and what has been said in order to learn more from him. A class with sensei is a mix of many things and often the things is saying bear more importance than the movements he is doing. Too many people come to Japan to do what they already know. This should be avoided at all costs! We do not come to do what we know but to discover new ways of doing the things we do badly. But for that we need to accept to make mistakes and to look bad. Too many egos won’t accept that. By accepting to make mistakes during training we free ourselves from the result and discover a more natural way of behovioring in the dôjô and in life. From this Friday class I learnt two things. First sensei was playing with the word tachi told us us that we had to stand upright in the technique and in life, once again the double meaning of jissen was obvious. Sensei used the image of the bowman pulling the string of his bow. In the technique use your shoulders to modify lightly the space between you and the opponent. Also, if you apply this you will keep your balance better and be in control of the tamashii. The second thing that I clicked on was something I had the chance to speak with him when we had lunch in Tsukuba. 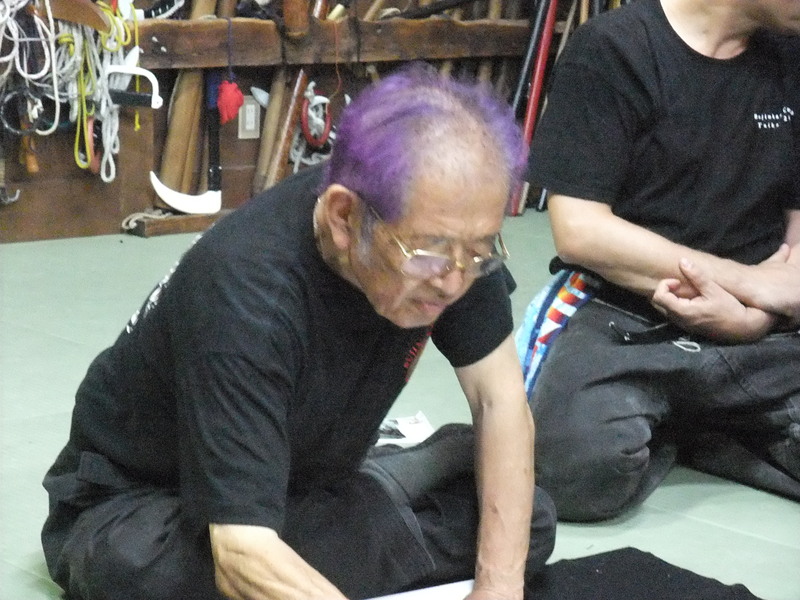 I asked him if the tachi kumiuchi could be considered as the juppô sesshô of weapons and he spent the class reminding us that by saying it and by using many weapons: tantô, jutte, tachi, bô, yari and shikomi zue. The tachi has opened the last gate to natural movement as it put into motion the nagare in all our movements. This class was also quite particular as sensei used Shiva as his uke many times. From my experience I see that as a symbol of recognition. We became direct students of sensei when we got our sakki test but when sensei is inviting you to attack this is something different. 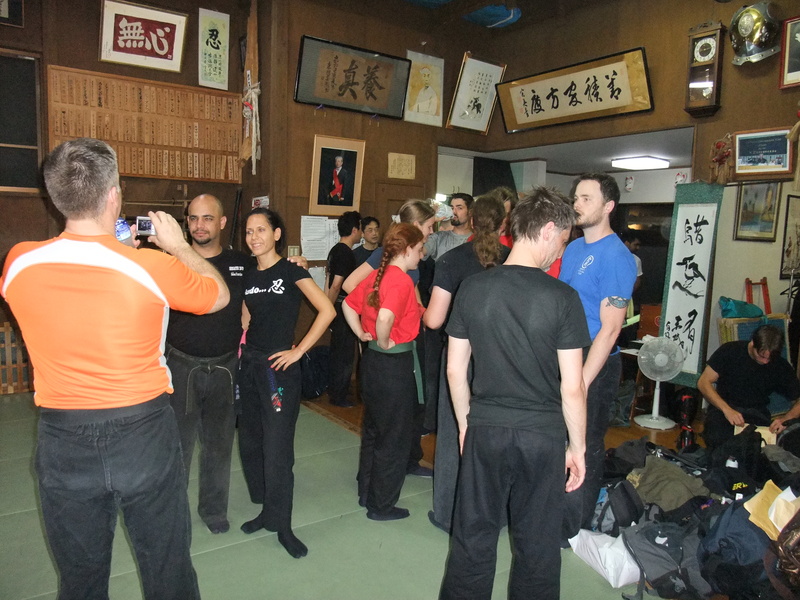 Not only are you recognized by him but also you become recognized by the whole bujinkan community. Congratulation Shiva for this new achievement in the ways of budô! To reinforce it sensei drew a very nice makimono with a daruma to thank the Japanese consul in Bangalore. The bujinkan through Hatsumi sensei’s guidance has really become international and we should never forget it and behave accordingly. Now this was one great article! Thank you for sharing some details about your path in Budo. 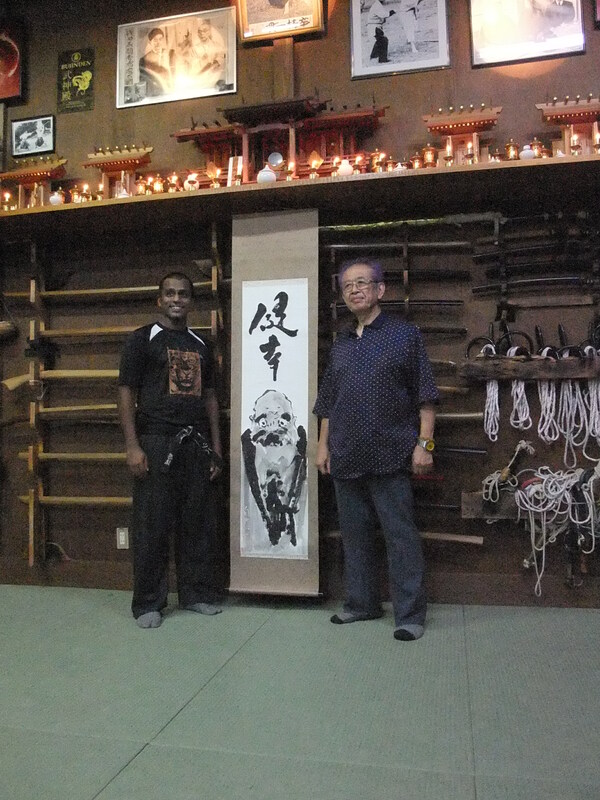 Having Hatsumi Senseni teach around you and having Hatsumi Sensei teach to you is very different. Anytime I get to be his uke or uke for any one of the Shihan remains the best experiences for my growth and a gift. Hard lessons and inner lessons that change our path in life. 1-to-1 Budo in a crowd! Each trip to Japan I get to see all my bad points magnified. I think that’s a precious gift right there. To receive guidance in how to remove our bad points… personally.